Huge Price Reduction!!! Prime Location! Privacy! Quiet! Bright Open Floor Plan! All of this and just minutes to shops, restaurants and the rest of the valley!!! 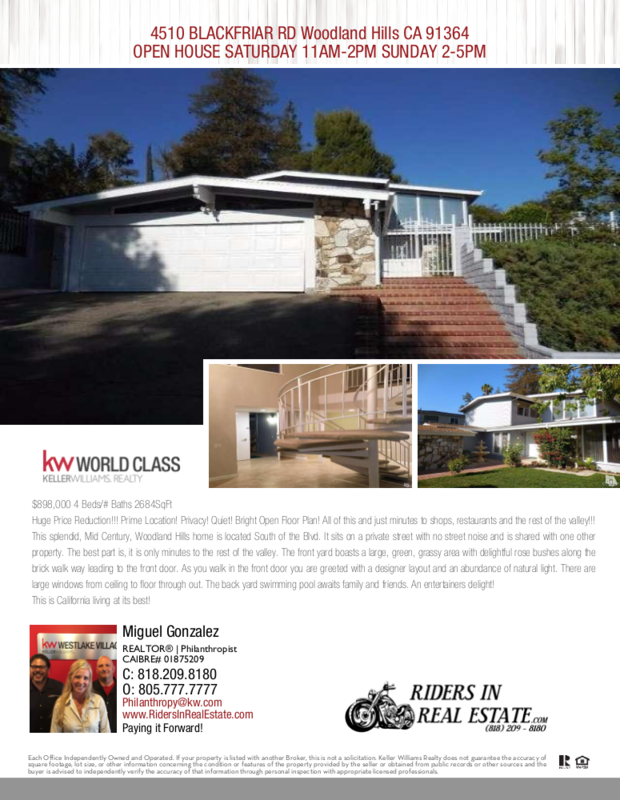 This splendid, Mid Century, Woodland Hills home is located South of the Blvd. It sits on a private street with no street noise and is shared with one other property. The best part is, it is only minutes to the rest of the valley. The front yard boasts a large, green, grassy area with delightful rose bushes along the brick walk way leading to the front door. As you walk in the front door you are greeted with a designer layout and an abundance of natural light. There are large windows from ceiling to floor through out. The back yard swimming pool awaits family and friends. An entertainers delight! This is California living at its best!